Has Gold Lost its Safe Haven Appeal? Let’s review gold’s recent price performance. If we compare gold to silver, where the major consumption demand of the latter is from the industrial sector, it is notable that gold has been outperforming silver in the last several years (fig.1). Indeed historically, whenever the gold-to-silver ratio approaches 80:1, it usually signifies that market tension sentiment is at peak levels. The last time this was seen was 10 years ago, when the global markets were in the midst of the Global Financial Crisis. The widening gold-to-silver ratio, which has been escalating since mid-2011 (including the period between 2012-2015 when most metals were considered to be in a bear market), has illustrated that gold still outperforms silver by a wide margin. This shows that some funds considered the investment markets ‘unsafe’ and chose gold as a safe haven asset (fig.2). The relationship between gold and platinum has also shown similarities. The gold-to-platinum ratio reached a high of 1.54:1 in August/ September this year. While part of the weakness in platinum is being impacted by market sentiment on the future of diesel engines, this upward trend of the gold-to-platinum ratio began in 2014, a year before the Volkswagen emission scandal. In recent years, there have been several issues that have caused concern to markets: the financial stability and cohesion of the EU, a breakout of hostilities on the Korean peninsula, the increasing yields on US bonds that may drag the global bond market into bear, the UK’s exit from the EU in 2019, the negotiating style of the US President Donald Trump, and the various obstacles that the Chinese economy needs to overcome to avoid a hard landing in 2018-2019. Indeed, the widening gap between gold, silver and platinum over the last few years (most recently evidenced in the gold-to-silver ratio surpassing 80 in the first quarter this year and again in August), reflects the common market belief that market risk has been increasing over time and signals that risk-averse sentiment reached peak levels. Sentiment turned critical when the US threatened to wage a trade war against other economies, most notably, China. 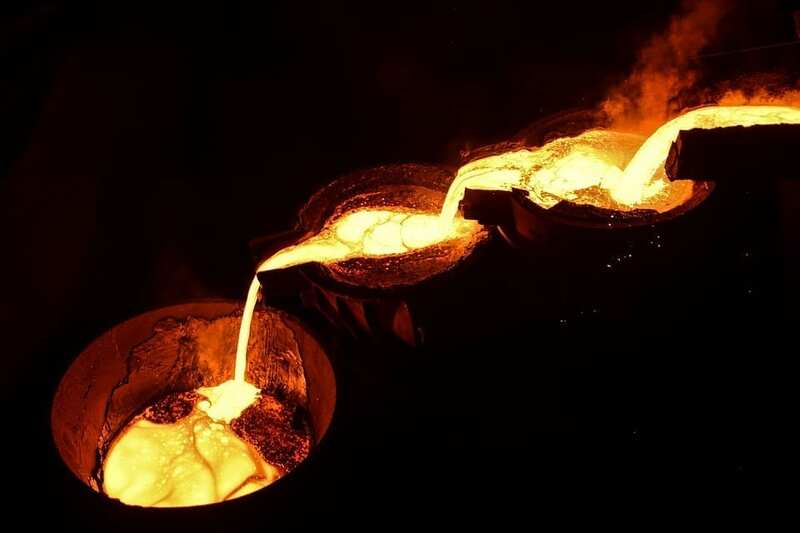 President Trump has threatened to introduce new tariffs on $200 billion worth of Chinese imports on 15th June, resulting in gold dropping $25/ oz in a single day. As the trade war has continued to intensify, it has fueled a surge in the dollar which has resulted in downward pressures on most commodities, including gold. As the dollar has surged, global capital has flowed out from global markets (especially from the emerging economies) back into the U.S. Against the dollar, the Turkish Lira and the Argentine Peso have lost 75% and 50% respectively, with both the Indonesian Rupiah and the Indian Rupee hitting record lows. The hyper-inflation in Venezuela even forced the government to implement reforms in its currencies, and has forced millions to leave Venezuela for a better chance of survival. The gold-to-silver ratio reached over 83:1 in September as investors lost confidence in non-US markets. A financial crisis of the emerging economies is developing, which could possibly turn into something similar to the 1997 Asian Financial Crisis. If we examine the returns of various metals in 2018, gold only underperformed palladium (by a very thin margin) and rhodium (fig.3). This shows that despite gold losing value (in dollar terms), at least it is outperforming most of its peers by limiting the loss. The gold price could possibly be under further pressure in the short term. For one, the US-China trade tension does not look like it will end anytime soon. Secondly, the situation of emerging markets could become worse before it becomes better. One of the tools that the author uses to aid short-term price prediction is to examine the Gold/Philadelphia SE Gold and Silver equities index (fig.4) After it peaked at over 25:1 towards the end of 2015, the gold-to-XAU ratio fell sharply in 2016, but slowly crept back up in 2017. The upward momentum accelerated in 2018, when the ratio reached above 18:1 in August/September. The rise of the ratio indicated that the market prefers physical gold as the safe haven asset relative to gold equity, because the latter is just a stock equity. 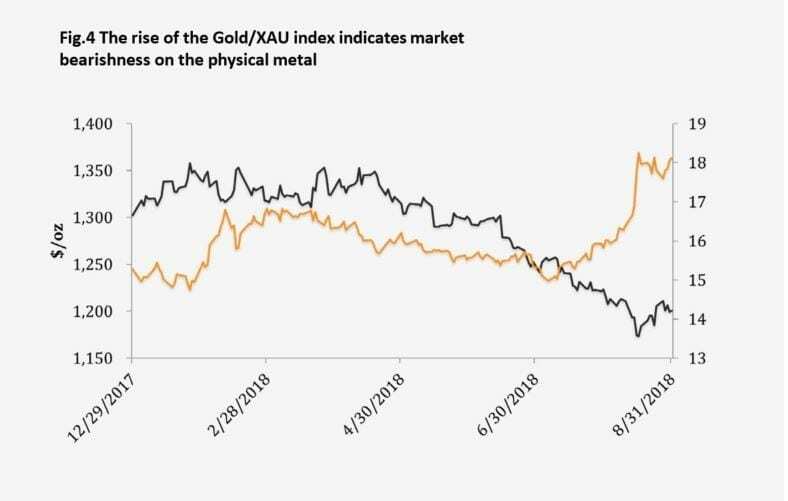 As a result, the author expects that the Gold/ XAU ratio should reverse downwards sharply once smart money believes the bottom of the gold price is close, and starts redeploying their capital into gold equities, anticipating the price rally in the physical metal. In contrast, the ratio could continue to rise, signaling that there will be further price weakness ahead for the physical metal. To examine gold’s prospect in the long term, we can take a look from both a psychological and fundamental standpoint. From a psychological perspective, we can examine the managed money positions according to the US Commodity Futures Trading Commission (CFTC) weekly reports. As of 28th August, gold was in net short of 216 tonnes equivalent, slightly retreating from the record highs in both short (190,499 contracts) and managed net short (244 tonnes equivalent) recorded for the week of 15th-21st August. In fact, gold was already in managed net short for seven consecutive weeks since mid-July, and looks like it will set a new record. The longest streak of net short previously was eight consecutive weeks that ran through 17th November 2015 – 5th January 2016. The bearish sentiment in gold and other metals is at extreme levels, the worst since CFTC amended its disclosure of data in 2007. It is not an exact rocket science that one should invest when the market sentiment is bearish and sell when the sentiment is extremely bullish. Be a contrarian or be a victim. From a fundamental stand point, the weakness of the gold price may be exaggerated due to the typical summer doldrums. People outside of the US (i.e., the Chinese) may begin buying physical gold as their domestic currency is depreciating. The gold price is at least relatively stable, compared to the domestic equities markets. It remains to be seen if the international gold price will improve considering physical demand begins to pick up traditionally in late September/ October due to wedding and holiday seasons. In addition, the market has probably overestimated the pace of the US rate increases this year or next, as President Trump has already voiced his displeasure about the Fed’s recent decisions. Despite the fact that the Fed works independently from the US government, it is already apparent that Trump shows little patience with officials that do not buy into his program and that he would not hesitate in replacing them. Indeed, the upcoming Fed meetings in 2018 could possibly be a good excuse for the Fed to at least halt the interest rate once (the market expects the Fed will hike interest rates twice more in the September and December meetings) given the current market turbulence seen in the non-US markets. In the longer run, whether the US wants to lessen its debt burden in real terms (especially revenue already lost due to tax cuts), or expand the country’s manufacturing sector, the only way to fulfill these strategies is for the dollar to depreciate against other currencies so that America can remain competitive. As a result, the author thinks the Fed target rate will remain below 3% in the long term, and a weaker dollar is likely to benefit commodity prices. The obvious risk against gold is probably a crash and burn of a major non-US economy because global liquidity will rush into dollar assets again as flight to safety. This may result in a lower gold price in dollar terms. Gold will face further risk if the US equity market turns from bull to bear.